Relax And Enjoy The Lifestyle! In this spacious and elegantly designed beachfront apartment, you can idle away the sunny days, stretching out on the terrace or beside the pools. You can stroll across to the beach, and have a drink or meal at the smart beach cafe which is open almost all the year round. 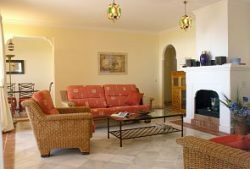 The apartment is situated in a quiet area on the less developed section of the coast beyond the main Costa del Sol, yet within easy reach of bars and restaurants, excellent golf courses, Marbella and Gibraltar. Parents will enjoy the peace of the La Perla de la Bahia complex, with Moorish-influenced architecture and carefully tended gardens with their palm trees and colourful flower beds. Children will love the toddlers' pool and the direct acces to the uncrowded beach. The first-floor apartment is tastefully furnished to the highest standards, with extra-wide super king-size bed in the master bedroom, and jacuzzi-style whirlpool bath. There is direct lift accesst from the underground car park Other amenities include air conditioning/ heating and a well appointed kitchen. But you may not wish to eat in, given the variety of restaurants nearby offering regional and international cusines. You can dine on the beachfront or in the restaurants on the hill leading to the white-washed village of Casares.